Ha, glad you like them. They were pretty cool. 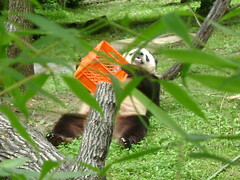 They put honey on the crates and the pandas sit and lick them and love them all over. There was a lot of fun stuff to take pictures of. I always take too many pictures at botanical gardens!